Life was pretty peaceful for Atl the Aztec goat herder. That is until the legendary El Chupacabra showed up to decimate his four legged friends. Against such a mighty foe, how can Atl save the day? Maybe with a little divine intervention? 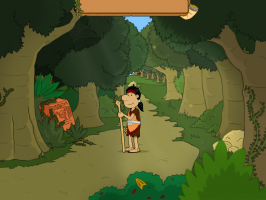 Join our cowardly goat herd on his journey and find out in Goat Herd and the Gods! 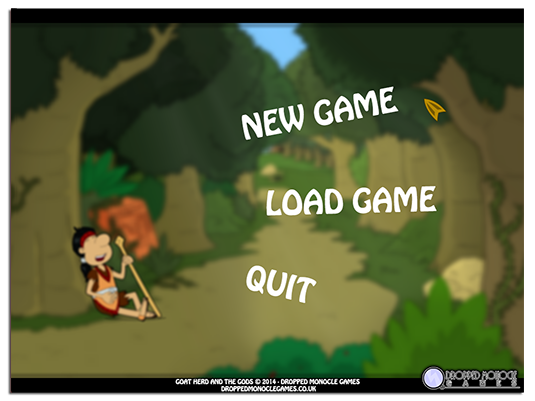 Goat Herd and the Gods is a short point and click adventures game, and is the second title from Dropped Monocle's team. "It's nice to see a game that tries a setting besides the usual stereotypes. The story is simple but engaging, the graphics are excellent with very good animations and even short video sequences and there is also a fitting soundtrack. However, the puzzles - while rather easy - feel a bit forced and unnecessarily complicated with lots of walking forth and back. None the less, this is a game to enjoy for the great humour and high production value." This is one of the first games in a while that I enjoyed so much I played it straight through. A really solid, well-produced piece. - The graphics and animation are *superb*. Excellent 2D cartoon work. - Composition-wise, the whole game feels really polished from the intro to the ending credits. - One pixel-huntish puzzle item. But once I knew generally what I needed, at least there wasn't too much to explore to find it. - A few background items around that make you think they'll be involved in puzzles and never come into play. - This game is begging for voice acting. :) Morgan Freeman needs to be the narrator. Overall, fantastic job, guys. I would *love* to see an extended sequel with more puzzles.